We have been so thankful for Monique Wischusen and her ministry among us as the Director of our Verdery Counseling Center. She has been a source of hope and healing for numerous clients, parents and children over her valuable time here at First Baptist Church and I have been so thankful to have been serving as a partner in ministry. We have all also been blessed by her weekly words of wisdom through Monique's Meditations. Each week in our weekly email update, Monique has offered insights and brief suggestions for better living and healthy coping. We are indebted to the many ways that she has touched our lives and given a sense of perspective and grace. I have the sad but also happy news of sharing that she is resigning as our Director of the VCC; but her reason is to focus on being a mom. Monique and Peter have the brand new and beautiful task of raising their lovely daughter, LaRue. Peter also has begun a new journey as a co-pastor in a new church start through CBF. We hope that they both will continue to stay connected to us, but want to wish them well in their exciting new journey as a family. As a part of our hopes for them, we will be hosting a reception in Monique's honor on May 5th at 9:45 immediately following Fresh Start worship. We hope many of you can join us as we wish Monique, Peter and LaRue beautiful blessings for this next stage of their lives together. Thank you for everything, Monique. David Jordan, your leader for the trip, will be going over important details to help you prepare for your journey to the Holy Land in 2020! Do you enjoy spending time in the garden or outside among the plants and the trees? If you answered yes, then this opportunity might be for you! 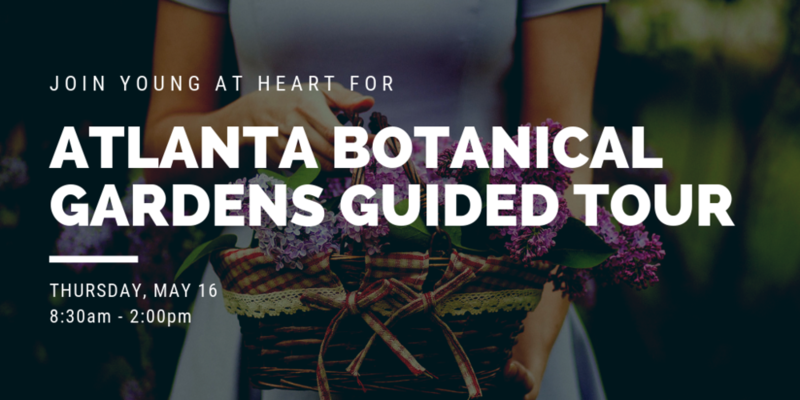 Join Young at Heart for a special guided tour of the Atlanta Botanical Gardens. The gardens will be “dressed” in Imaginary Worlds plant sculptures, including ones from Alice in Wonderland in the Skyline Garden. Following the tour, the group will head over to Mary Mac’s Tea Room for a special lunch of vegetable soup, a house salad, breads, tea, and soda. *No discount for current membership holders. The church administrative and ministry offices will be closed on Friday, April 19 and Monday, April 22 in observance of Good Friday and the Easter holiday. Normal office hours will resume on Tuesday, April 23. No registration is required. Simply show up in Carreker Hall on April 28. We hope you and your family consider joining us for our Holy Week activities this year! Holy Week is the seven days leading up to Easter, beginning with Palm Sunday. Looking to learn more about First Baptist Church of Decatur, like what to expect and where to park? Start here. And join us for our orientation at 10:00am on Sun., April 28!